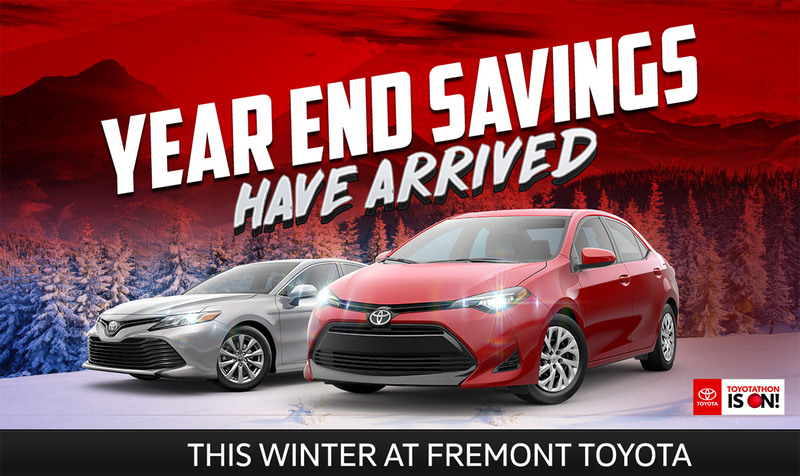 The Year End Sales Event is happening now at Fremont Motors. See our great offers on Toyota. If you have any questions about any of the Fremont Motor Company dealerships, need to bring a model in for service, or think we can help you in any way before you come in, feel free to contact us directly. Otherwise, we look forward to seeing you at one of our many dealerships! STK # 14T17257. Prices include all applicable dealer incentives and manufacturer rebates and are based off MSRP, not all buyers will qualify. Current offers are not available on prior purchases or pre-negotiated deals. Customer cash rebate will be applied to purchase. Payment is plus tax, tag, title, and $389 dealer fee. See dealer for details. Offer expires 11/30/2017. STK # 14T17306. Prices include all applicable dealer incentives and manufacturer rebates and are based off MSRP, not all buyers will qualify. Current offers are not available on prior purchases or pre-negotiated deals. Customer cash rebate will be applied to purchase. Payment is plus tax, tag, title, and $389 dealer fee. See dealer for details. Offer expires 11/30/2017. STK # 14T17334. Prices include all applicable dealer incentives and manufacturer rebates and are based off MSRP, not all buyers will qualify. Current offers are not available on prior purchases or pre-negotiated deals. Customer cash rebate will be applied to purchase. Payment is plus tax, tag, title, and $389 dealer fee. See dealer for details. Offer expires 11/30/2017.